Hot melt adhesives are usually in the form of thermoplastic adhesive that is applied with the help of hot glue gun as a result of which these adhesives are also known as hot glue. There is the presence of a huge array of polymers in this category that comprises of both synthetic and natural adhesives. The global hot melt adhesives market was valued at USD 7.9 billion in 2017 and is expected to contribute revenue of USD 11.9 billion by 2024, registering a CAGR 6.1% during the forecast period (2018 – 2024). The growth of this market is attributed towards the increasing capability of consumers in spending power in developing countries along with increasing expansion of the packaging industry. It has been observed that the automobile manufacturers are shifting trends from traditional methods to newly executed assembly technique. These newly executed techniques are extensively being preferred by the consumers since the design of vehicles are changing pertaining towards the development of innovative vehicle designs that are using nonferrous metals, coated steels, lighter gauge metals, and plastics. These factors are ultimately ensuing excessive growth opportunities for global hot melts adhesive market in the automobile domain. 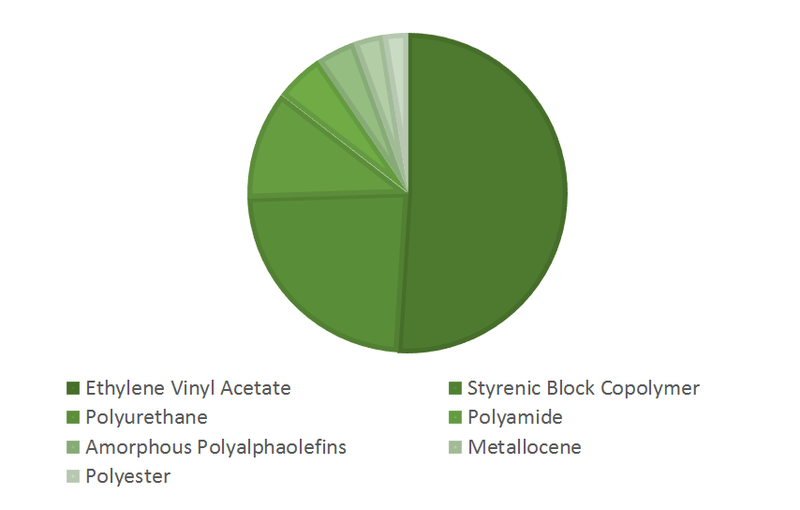 On the basis of type, the global hot melt adhesives market are segmented into styrenic block copolymers (SBC), polyamide (PA), polyurethane (PU), ethylene-vinyl acetate (EVA), amorphous poly-alphaolefin (APAO), polyester, and metallocene polyolefin (MPO). Among all these types, EVA have been generating the largest revenue throughout the estimated period. This segment has been generating USD 3.2 Billion in 2017 and is further anticipated to generate USD 4.6 billion by 2024. The growth of EVA segment is driven by its various benefits such as durability, quicker time setting, and suitability in a huge variety of temperatures. Moreover, rapid increase in the automobile and construction domain, the demand for EVA is expected to increase exponentially in the near future. The packaging, non-woven, book and paper binding, footwear, construction, furniture, and the electronics industries have surfaced as the key end users of hot melt adhesives. Among all these industries, the packaging sector has been observing rapid demand in the hot melt adhesives market and is further anticipated to contribute the largest revenue in the near future as well. The construction sector is also projected to report excessive growth for hot melt adhesives in the near future. On the basis of application, the global hot melt adhesives market is segmented into furniture, hygiene, bookbinding, packaging solutions, automobile, textile, electronics, footwear, and others. Of these, automobile application is expected to witness the fastest growth, registering a CAGR 7.0% during the forecast period. The fastest growth of this application is attributed towards expansive use of hot melts in the components of commercial and personal vehicles in the countries of developing the economy. Furthermore, it has been observed that these adhesives are extensively being used by the automobile domain, as a result, it is expected to further bolster the growth of the global hot melt adhesives market. Increasing disposable income of the consumers in developing countries such as China, India, and Indonesia is the major factor driving the growth of the global hot melt adhesives market. As a result of increasing spending capability of consumers and demand for various products such as electronics, clothes, and footwear the demand for hot melt adhesives is growing at a rapid pace across the globe. For instance, in electronic offerings, these adhesives are used in joining two substrates. Moreover, extensive growth of the packaging industry and industrialization are another factors driving the growth of global hot melt adhesives market. Furthermore, the developing countries in Asia-Pacific are witnessing substantial growth in the hot melt adhesives market owing to increasing disposable income of the consumers and evolving trends of the consumers. These factors are pertaining towards the development of complex, varied and environment-friendly offerings that are further making these adhesives more accessible and popular among the consumers of this region. The fluctuating prices of raw materials of hot melt adhesives are the major factor hindering the growth of the global hot melt adhesives market. It has been observed that the raw material prices that are used in the adhesives are volatile and manufacturers are developing reform in order to maximize their profit margins. Balancing of cost of production and selling cost becomes a difficult task for the producer which is thereby restraining the growth of global hot melt adhesives market. Globally industry players of global hot melt adhesives market are leveraging market growth through shifting trends from traditional methods to innovative automotive assembly methods. Moreover, the key players in the global hot melt adhesives market are upgrading technology and developing new products in order to gain a competitive edge in this industry. Geographically, North America hot melt adhesives market is projected to generate the largest revenue of USD 3.9 billion by 2024, registering a CAGR of 6.1% during the forecast period. Moreover, Asia Pacific is expected to witness the fastest growth during the forecast period owing to flourishing infrastructure development in countries such as India and China. 10.2. Beardow & Adams (Adhesives) Limited. Table 65 Snapshot –Beardow & Adams (Adhesives) Limited. Table 68 Snapshot –Bostik Inc.
Table 73 Snapshot – DowDuPont Inc.
Beardow & Adams (Adhesives) Limited.